This holiday season, we’re giving you 5 books to donate to kids in need in local communities across the country through our partner First Book. #GiveaBook and give back to children in need in local communities across the country by entering your email and state below. Help those closest to you by entering your home state, or support disaster relief by entering a state with impacted communities. Can’t decide where to donate? No problem. That’s why we’re giving you up to 5 entries to donate up to 5 books (1 book donated per entry). 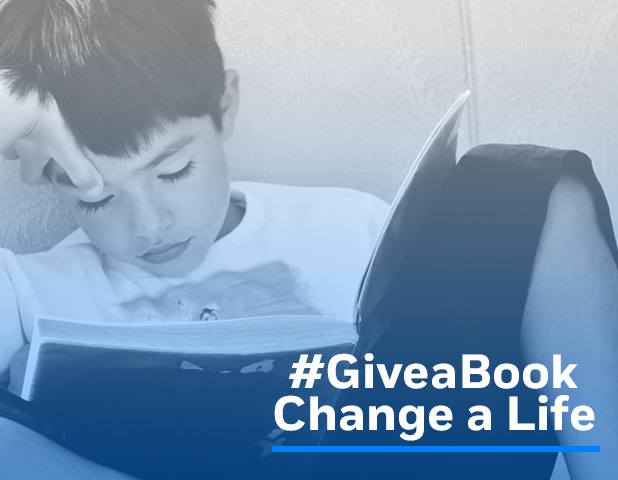 Join #GiveaBook now and help get 50,000 books in the hands of kids in need today. More about us: Penguin Random House and its family of publishing imprints are proud to support children in need in communities across the country through #GiveaBook in partnership with First Book. Read more about how we partner with authors to create stories that inform, entertain, and inspire here, and click here to watch and learn more about our commitment to publishing responsibly. More about First Book: First Book is a nonprofit social enterprise that has distributed more than 150 million books and educational resources to programs and schools serving children from low-income families across the United States and Canada. If you serve children in need of any ages from birth to age 18, you can sign up (for free) to receive access to all First Book resources here. By selecting a state above you are requesting that First Book distribute a new book to a child in need in that state. In the event that requests for a given state exceed the demand for books from that state, First Book will distribute any additional books nationally to children in need.